This bridge is intelligent . It has a probe core, fuel cell, vernor engines and landing gear. Use hyperedit to land it somewhere, while it’s slowly descending you can use the vernor engines to change the attitude. Retract landing gear after it has settled. At 46t truck has successfully driven over it! 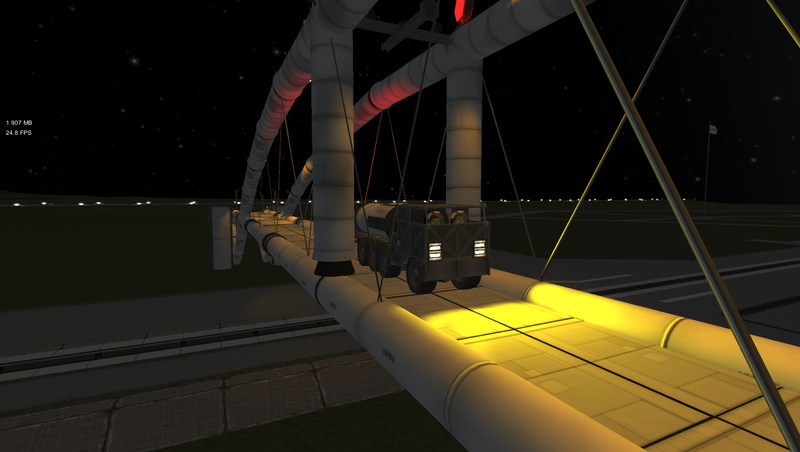 Don’t forget to enable the fuel cell or the street lights will drain the battery in a minute. In the editor: first select the offset gizmo, then shift-click on any part, and it will choose the root part. This way you can slide it all the way in or out the SPH.